Car repair can be scary but sometimes you just don’t need a mechanic. 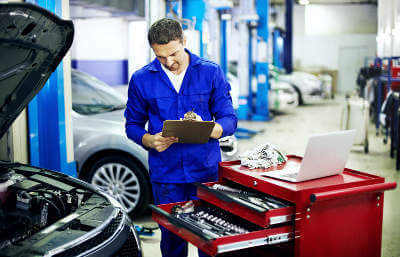 In the past we've discussed how long it takes to repair a car and how major car repairs should always be handled by a professional for the sake of your car’s health. However, there are a selection of simple fixes that people are bleeding money on by sending them into the garage, rather than getting down and dirty with the work themselves. And that’s what it’s all about! Yes, of course, there’s a financial benefit to performing some simple home repairs- you’ll save money. Lovely. However, that’s not what this is about here. It’s about the satisfaction you will get personally from knowing that your prized ride is thriving because of the TLC by your own hand. A simple B&Q tool kit is all you’ll need to perform these repairs, in addition to the replacement parts themselves. With links to guides, the tools you'll need and a few due safety concerns, it’s time to get hands on with your car and our guide towards how you can best repair it yourself today. With a bit of care, changing your car’s battery can be a far simpler and safer task than popular opinion would have you believe. Car batteries are at their most dangerous when they’re not properly cleaned, meaning we recommend you read the guide here thoroughly before getting started. So long as you take proper precautions, make sure the engine is off and cold, and that you properly clean the sulphate crystals off the terminals and cables. Staying Safe: Old car batteries can sweat or might have cracks in their casing. It’s recommended you handle the battery with rubber gloves, to protect yourself from any acid exposure to your skin or residual electric shocks. One of the simplest and most relaxing fixes you can do for your car, replacing the air filter should take little more than a minute or two, and is virtually the same procedure as cleaning the filter in your tumble drier. Depending on the type of roads you frequent, it’s recommended you change your filter every 20-30,000 miles and cleaned at 10,000. Staying Safe: The air filter is one of the safest fixes you can make on a car. That said, make sure your engine is off, car out of gear and bonnet properly secured with the prop shaft. The actual replacement of your spark plugs is a straight-forward affair but does come with a couple of pitfalls people can fall into if unprepared, primarily making sure that you replace the old spark plug with one of the same amperage. Staying Safe: As the guide states, make sure you replace the plugs in order, to avoid electrical backlash when you restart the car with the new plugs. We’ve already been busy putting together our own guide on this one, as it’s one of the car components that most often fail the MOT and this is surprising, as broken lights are easy to diagnose and just as easy to fix. If you’ve replaced a bulb in your house lamps and lights, you’ll find replacing a car light a breeze. Staying Safe: Obviously keep the car turned off to avoid the chance of electric shocks. Otherwise, be wary of broken glass should the bulb(s) smash. The most advanced task on this list, this one will take longer and requires more tools than the other selections on this list but is still equally doable at home. Before hand, you’ll want to know which oil is the best oil for your car and prepare your area by laying down some cloth or plastic sheeting to minimise the clean-up job afterwards. Staying Safe: Make absolutely sure you’ve jacked up your car properly and firmly, and that you’ve inserted the jack stands securely. It’s common sense but it can’t be understated that you’re about to slide under a 1,500kg car. Make sure you’re safe. It’s a strange thought to think that some folks will still go into a garage to get new wipers installed. Alike many car repairs, because it’s on a car, people assume it’s a more difficult procedure than it actually is. Replacing blades is very easy and requires little more than the unhooking of one and rehooking of another. No tools, no fuss. What You’ll Need: Nothing! Just the new wiper blades. Staying Safe: Be wary that some wipers are spring loaded, meaning they can snap back down from the lifted position and either hurt you or crack your windscreen. Changing a fuse in a car is the same process as changing one in the house. You can locate your car’s fuse box by consulting your manual and thereafter it’s a pretty regular process. As with the spark plugs, make absolutely sure you choose a fuse with the same amperage as the one you’re replacing. Other than that, it’s as simple as in and out. What You’ll Need: Tweezers, although many car fuse boxes come with their own special tool already supplied. Staying Safe: It’s recommended to use the provided tongues, although a regular pair of tweezers works too. As with all electricals, the chances of residual charges are possible, so take precautions. Changing your tyres is the traditional car DIY and even if you don’t intend to change your tyres at home, it helps to know how in the case you’re stranded with a flat in a remote location. In addition there are many benefits to maintaining your wheels at home making a little care and attention to your wheels, and particularly rotating them, a worthy endeavour. Staying Safe: Ensure your car is jacked up properly and don’t lift anything that is too heavy for you. When lifting the tyre(s), lift through your knees, with your back straight and not doubled over. Many people are put off by home vehicle repairs. Cars are complex beasts and people fear the fees should something go awry. The truth is however with a little preparation, the right tools and your careful care and attention, you can actually save yourself a good deal of cash with some home repair. All the entries in this article are very capable of being performed safely and perfectly at home. However, always place your safety first and if you feel as though you’re wading into waters you don’t understand, don’t force the issue. Your car comes first and although these repairs can be done by anyone, your safety and health is too important to be brazen about. If you feel as though you would rather take these repairs into a garage, have a check for a quote with us before heading for your nearest garage. There’s every chance you will make savings.